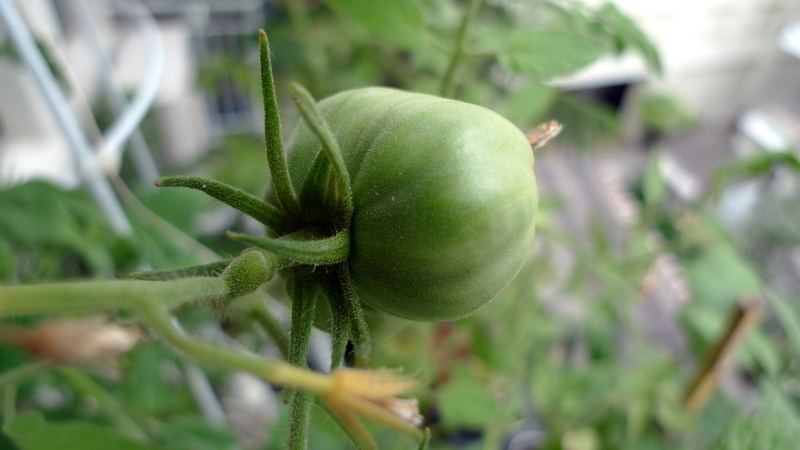 While the autumn harvest back in November was meagre – two cherry tomatoes and two radishes – my balcony garden has done somewhat better in the intervening months. Recently, a handful of larger tomatoes have appeared, my container eggplant plant has been doing well, and I’ve even discovered a batch of small earthworms living in one of the pots. Pretty pale violet blossoms on my container eggplant plant. Its broad leaves look slightly prehistoric but the tiny bees love the flowers and it has turned out to be the most productive plant in my garden. 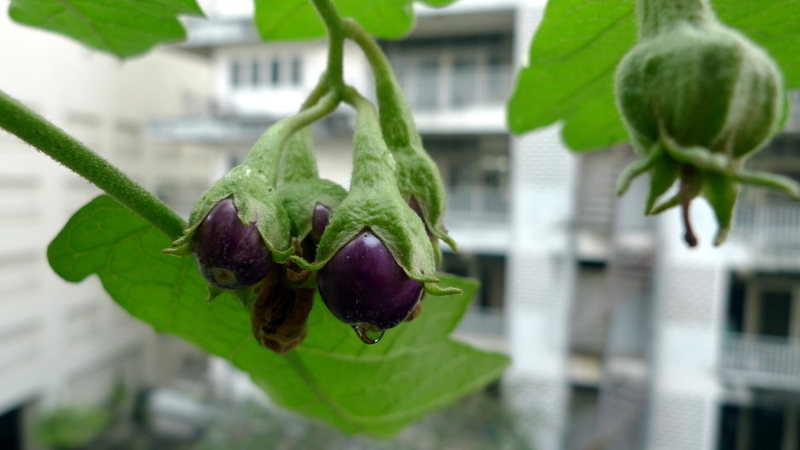 The plant produces these small purple fruit that grow to about the size of a golf ball. We had some unseasonable rain for several days in January, which didn’t seem to harm the plants, but slowed the ripening of the fruits by a few days. The first harvest of eggplant. I think a few of them (the yellowish ones) got a little sunburned but they tasted fine. I used these to make some baba ganoush. Frankly, miniature eggplants aren’t the most convenient for grilling then scraping out the flesh because there isn’t much flesh left after the grilling is complete! My second watermelon radish grew to a healthy size, much larger than a golf ball though not nearly so large as a tennis ball. Interestingly, instead of pushing down into the dirt it pushed itself up, keeping a long trailing root. Proof that my soil has too much clay in it and needs more work. 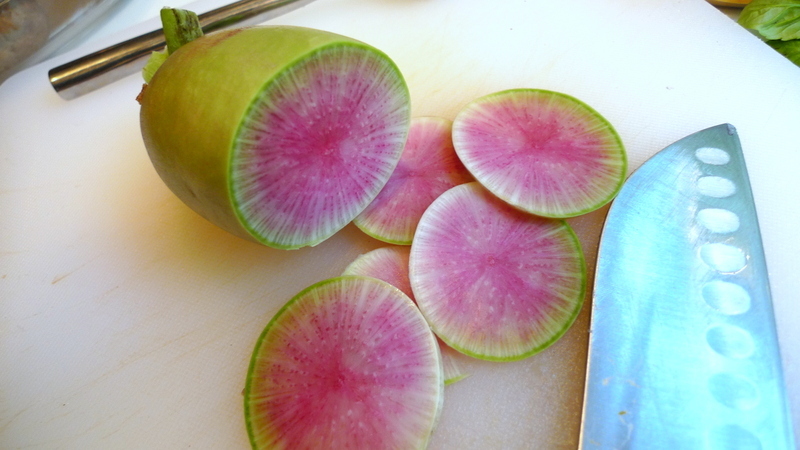 Cutting this radish, I got a good look at the unique coloring. Whereas my first radish (yeah, I only grew two – root vegetables take up too much space) had a pale pink exterior, this one looked more like the picture on the cover of the seed package. 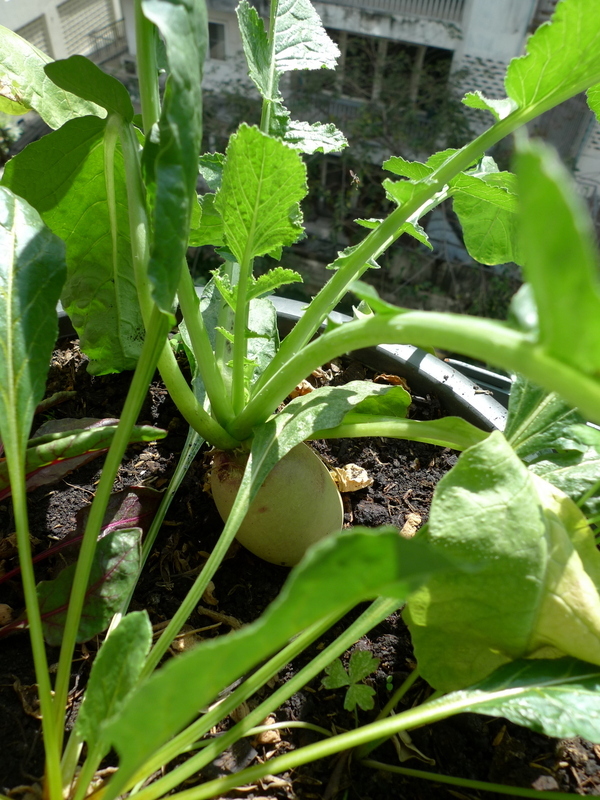 By letting the radish grow so large, it developed a pretty sharp taste, but I actually like that. While my first tomato plant never produced more than two cherry tomatoes, the two remaining plants, both of the Chianti variety, were a bit more productive. They required some creative support since the gardening shops have been out of proper tomato cages ever since the floods a few months ago. Despite the ad hoc support system, there are five or six fruits that finally set. We never really had enough of the cooler nighttime temperatures that help the polinated blossoms to set. 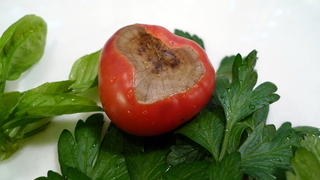 The fruit size is relatively small – just a bit smaller than a tennis ball – and there is some blossom rot on the bottom caused by my watering habits. I’ve learned that it is better to give tomatoes a really good soaking every second or third day rather than giving them a moderate watering every day. 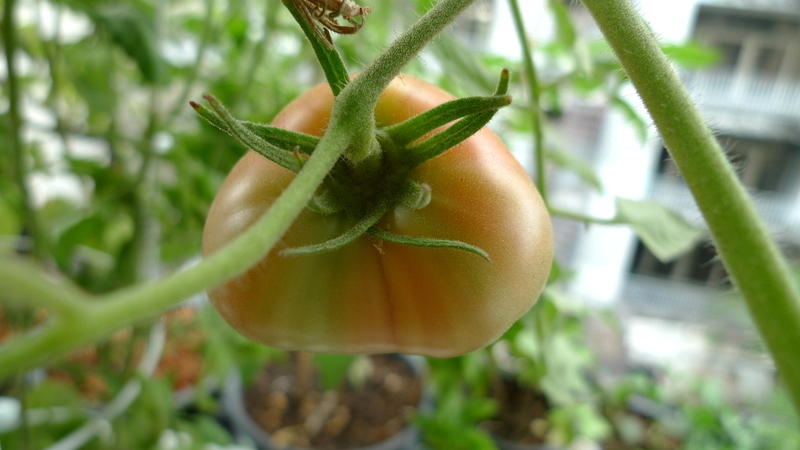 The first of the tomatoes already ripened and the edible parts were really sweet, dark red, and juicy. These two plants will be finished after these fruits are ripe but I have another plant about eight inches tall and hopefully I can have some better luck with it over the next few months. I also harvested two of the half-dozen carrots I’ve been crowing. 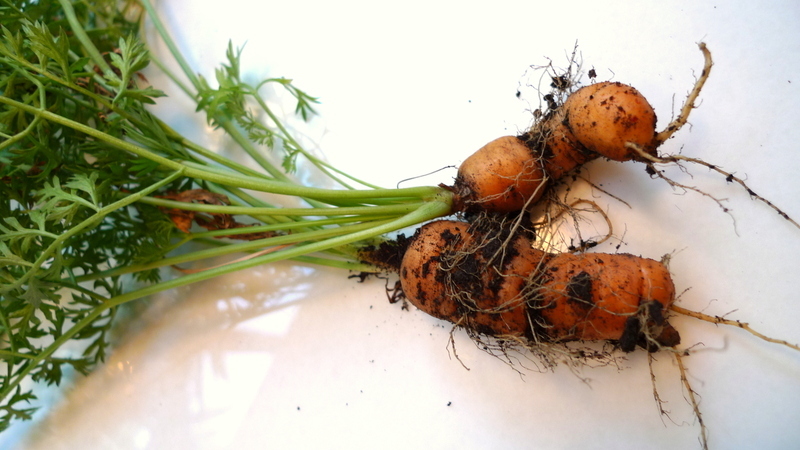 These were a petite French variety and you can again see the effect of too much clay in the soil: very misshapen carrots. I cleaned them up and put them on a salad, though, and they tasted nice. Again, root veggies just don’t make a lot of sense in a balcony garden. Vertical plants are much more efficient. The last bit of good news from my garden: after pulling out the original cherry tomato plant, I was ammending the soil and discovered dozens of small (inch-long) earthworms. Don’t know where they came from but I hope they continue to breed. I transferred many of them to two spare sacks of soil and compost, added some vegetable scraps from my kitchen, and hope they will work over the next several months to help give me better quality soil. Who knew finding worms could be so exciting? 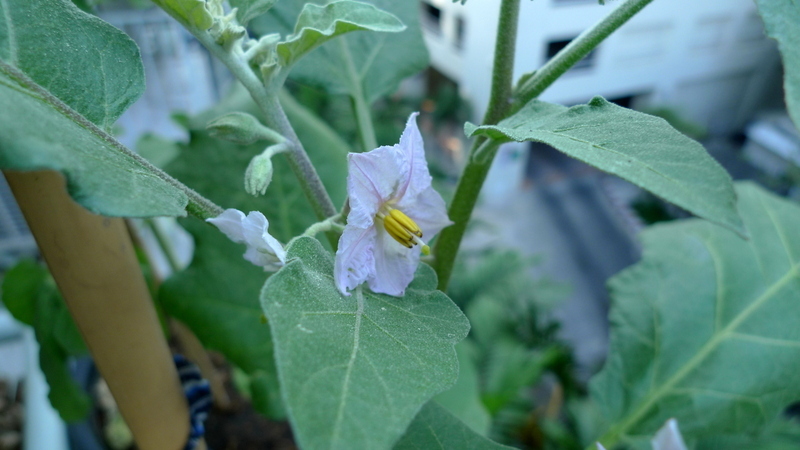 This entry was posted in Uncategorized and tagged Balcony, garden, gardening, Worms by christao408. Bookmark the permalink. Nice post and I say this reluctantly couse veggies just aren’t my thing. looks like a great first harvest. i get excited about earthworms too… we have a back yard (although it doesn’t get enough sun to plant anything worthwhile, sadly) and when it rains in the spring/summer i sometimes go hunting for earthworms that i can transplant into the containers on my front porch. glad you got some earthworms; that should really help the soil a lot! I don’t know that I have ever seen the smaller eggplant…we always get the larger ones and fry them…not nearly as exotic as you but still yummy!! YAY for earthworms! Seriously as you know that can help the soil a great deal. Some improvement in the soil and the produce will get larger and juicer. My compliments! You’ve done a great job ! Honestly, I wasn’t sure if you would be successful with this vegetable garden of yours. Its hard enough growing one in the backyard let alone on a balcony. So, once again you have proven to be a master. Got one green thumb there ! O wow it’s coming along nicely! This is great Chris. 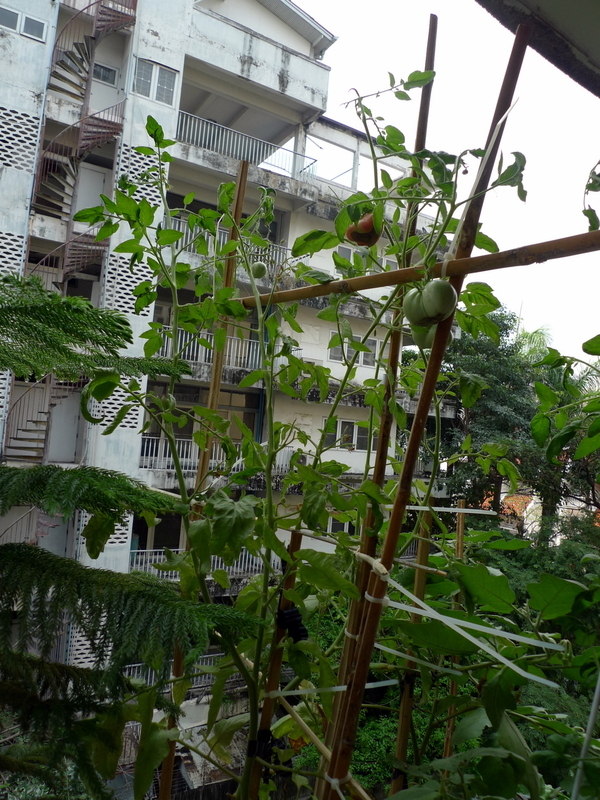 You wonder how the caterpillar got up on the balcony, no?These small eggplants ( brinjals ) are the best in taste. Stuff them with ground beef and tomatoes sauteed in oil , add spices like turmeric chili powder and ginger/ garlic paste along with salt. Make Two cuts in the brinjal, opposite each other taking care not to divide it completely. Stuff the cooked ground beef in it, and then saute a couple of large onions until they are transparent, and place the brinjals on the onions adding very little water. Close the lid and cook on low heat, turning the vegetable every five or seven minutes. 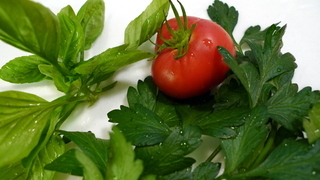 When the skin wrinkles, you can add a tablespoon of lemon extract, and more tomatoes if you wish. I have even added tamarind paste to the dish. Wow. Congratulations. I feel so inspired from looking at your post. If I had green thumbs, I would go out and start a vegetable garden of my own. :] For the carrots, would you have to plant new seeds in every season? the last time i had watermelon radish was back in SF in 2006. wait, was it maybe 2005? anyhow, it’s been years. looking at your pics making me missing my days in SF where beautiful organic produce are plentiful all year round. @KnightInCROATIANarmor – Thanks. One can appreciate others’ success even if you have different tastes or interests, right? @rudyhou – California is a wonderful place to get produce. The one year I lived in the midwest, I became aware of just how spoiled I had been in California. @Devilzgaysianboi – For all the vegetables, I have to plant new seeds each season, unless I purposely let one or more of the plants go to seed. @I_love_Burma – Back in the days when it looked more like a rice paddy than a garden! =D@ElusiveWords – I can only imagine that the worms must have hitched in on some of the original bags of dirt I used, since I first saw them in the containers that I planted early in the season. Yes, I’ll be sure to encourage their growth and will probably move ahead with the compost container idea I had talked about a few months ago. @hesacontradiction – @yang1815 – Thanks@kunhuo42 – @Fatcat723 – Yes, the earthworms are a major development. If I get a few containers for the dirt and create some compost buckets during the off season, I should have significantly better soil to work with next season. @ZSA_MD – That sounds like a good recipe. I just harvested a half-dozen of the eggplant and another tomato so maybe I can try them that way… although I’ll have to substitute another meat since Tawn doesn’t eat beef. @murisopsis – Already thinking ahead to October 2012, when my next growing season begins. When I head back to the US in May, I’m seriously considering smuggling some blackberry clippings back here. I wonder how those would do? @The_Eyes_Of_A_Painter – Thank you. I wasn’t expecting much success and the yields have been very modest. Hopefully, though, next season will work out better. 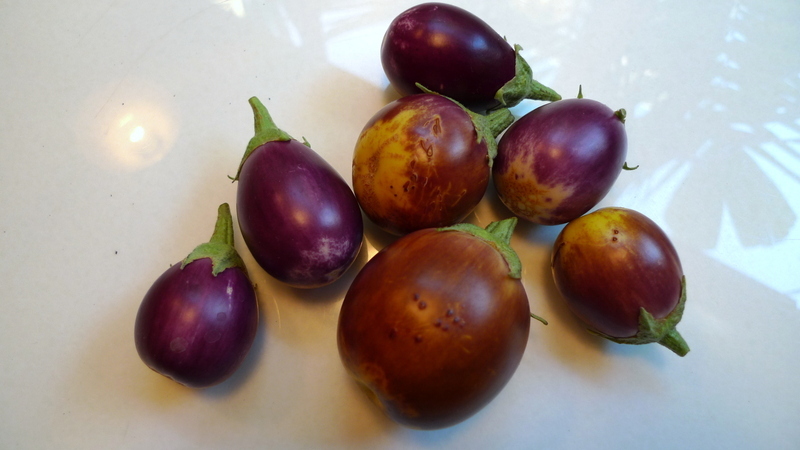 @Redlegsix – Yeah, I don’t know what variety those eggplant are but they were sold as “container eggplant”.